There is a new Nicholalala webtoon episode up on WEBTOONS! Read on the app or click below. Even while Hugh was on his strict diet we tried to still go out on dates. This was filmed during the last month of his diet. We headed to The Beastro in Hongdae for their amazing lunch menu. Sometimes on cheat days Hugh would go all out and eat anything he wanted, but this was the last month of his transformation so it was extra strict. He still managed to be healthy on his cheat day. Unfortunately right after uploading this video we found out The Beastro will be closing down in Hongdae. Their Instagram said to keep an eye out for future projects but at this point we don’t know if they will open something similar somewhere else. There is only one week left to eat this delicious food! Hongdae has been changing for years and unfortunately not for the better. Lots of big businesses moved in and we heard they are tourist zoning it. So all the charm and individuality is rapidly disappearing. That’s why Hapjeong and Mangwon areas are becoming more popular and where great restaurants are popping up. Links to the 2 latest Nicholalala webtoon episodes! The Nicholalala webtoon is a mostly fictional, scrolling webtoon on the WEBTOONS platform. It combines Korean folklore, imagination and the Korean countryside. Sometimes there are ongoing folklore stories and other times there are just small moments that have a grain of truth in them. 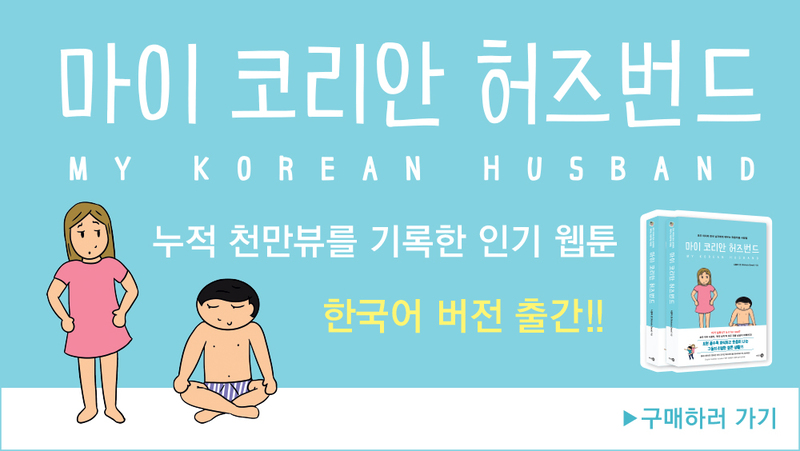 This series is different from our ‘My Korean Husband’ comics. CLICK HERE FOR FULL ‘KOREAN SUMMER’ EPISODE. CLICK HERE FOR FULL “FAN” EPISODE. The Nicholalala webtoon is updated every Tuesday! We also talk about prediction dreams in Korean culture and if my mother-in-law predicted correctly. How to compliment your pregnant wife. At least his made me laugh! We were on our way to do our weekly radio show and even in the morning it’s so hot in Seoul right now. I just feel sweaty and huge in the heat. Perhaps because I was wearing white, Hugh compared me to an angel… but soon made it weird by saying he would ride me if I was! I can’t wait for summer to be over. I’ve heard older people talk about how summer never used to be this hot (thanks global warming) and it seems like August is the most miserable month. I love summer in Australia, but not Korea. The humidity is the killer here. I’m also glad I’m not in my final month of pregnancy in August. It will be cooler when I’m at the end of the pregnancy. The latest Nicholalala webtoon episode is up on WEBTOONS! You can check it out there. Nicholalala is my other comic series which is a scrolling webtoon. Set in the Korean countryside with characters loosely based on us, and lots of Korean folklore characters. There is an article about us on the Huff Post about Hugh’s transformation video! What did he eat? Exercise? Tips? We got a lot of questions on Hugh’s transformation video about how he lost the weight. In this video we talk at length about what he ate and how he exercised. Rather than it being a strict diet and exercise plan, it was a flexible, healthy lifestyle change. One of the things that motivated him to start this big journey is the fact that we had to go through IVF (In vitro fertilization) to have a baby. Actually, there was always the chance that we would never be able to have children. IVF is a painful and often lengthy process that is very difficult physically and mentally for the woman. Even before starting IVF I had been through a lot with Endometriosis. Hugh knew how much pain I had been through and now had to go through with IVF so he wanted to change his life to benefit both of us. Although I can’t fall pregnant naturally (his fertility is fine), him being healthier can also help the process. He started this big change after a failed round of IVF and within 2 months I had become pregnant with the next round of IVF. This really felt like a miracle as our chances hadn’t been great. So knowing that he is going to be a father motivated Hugh even more to get healthy. It’s been overwhelming, not only how many comments are on the video, but how many friends immediately called Hugh after seeing the video. Several friends immediately got gym memberships. Everyone wanted to know what the “secret” was. There was no secret, just eating healthy and exercise. Hugh found the best way to do it was slowly over 6 months and to make good habits. He used to get slightly annoyed when I asked him to go for a walk with me but now he gets cranky when he hasn’t been to the gym in a few days! His body is so used to smaller meals and work outs now. The only extreme diet he did was the final month for the photo shoot. These photo shoots are common in Korea and it was important for Hugh to prove he could do it, and document it. After getting his weight down that low he had a week off (we went on a road trip) and he gained a few kilos, which he intended to do, and has now maintained a healthy but slim weight since. The message Hugh wanted to give was that we can make changes in our lives from right now. It doesn’t need to be extreme, even just smaller changes towards a healthier lifestyle.